Shutting down Microsoft’s robotics group? As a roboticist, it is sad news that Microsoft shut down their robotic group. I remember that MS released Robotics Developer Studio (RDS) in 2008 and I installed on my old laptop, Pentium 4 1.2GHz, Fujitsu 512MB RAM. It was a great simulator and a development tool, but couldn’t actually figure out how to use it or didn’t have too much interest on it. Anyway, I wish they didn’t throw away RDS and someone could take this in order to do something useful for robotics. Integration with ROS(Ha! There is Gazebo..) or any open-source? In 2007, Bill Gates wrote his influential “A Robot in Every Home” article in ScientificScientific American*, envisioning a future “in which robotic devices will become a nearly ubiquitous part of our day-to-day lives.” The article reflected his belief that robotics was going to be hugely important, and Microsoft had to have a major role in it. Two years earlier, Gates had asked one of his top lieutenants, Tandy Trower, also a big believer in robotics, to lead a group with the bold mission of bringing robots into the mainstream. This week, word got out that, as part of its current restructuring, Microsoft decided to shut down its robotics group. (Two sources at Microsoft have since confirmed the news to IEEE Spectrum.) At a moment when excitement about the future of robotics seems to have reached an all-time high (just ask Googleand Amazon), Microsoft has given up on robots. Microsoft’s decision may seem abrupt, but in reality the company’s enthusiasm for its robot initiatives has been waning for years. After Bill Gatesleft his day-to-day role at the company in mid 2008, Steve Ballmer reportedly expressed dissatisfaction with robotics being just a “strategic initiative” at the company and wanted to know how it could become a significant revenue generator. At that point, the group’s main project was a robotics development and simulation software package called Robotics Developer Studio (RDS). The goal was to make RDS into a tool that would allow anyone to easily program a robot (doing what BASIC did for the PC, in Gates’s view). But RDS was slow in attracting users, and the company was giving it away for free except to commercial users (which had to pay a fee). Gates and Trower didn’t see that as a problem: they had decided that Microsoft had to first prove itself with the robotics community, and that they would look for revenue opportunities later. With Ballmer in charge, though, the lack of a clear business model became an issue. After that the group continued to work on RDS, eventually making it completely free in 2010. RDS adoption was still slow, and now it faced formidable competitors such as the Robot Operating System, created by Willow Garage, which gained significant traction in research labs. The last major RDS release happened in 2011. 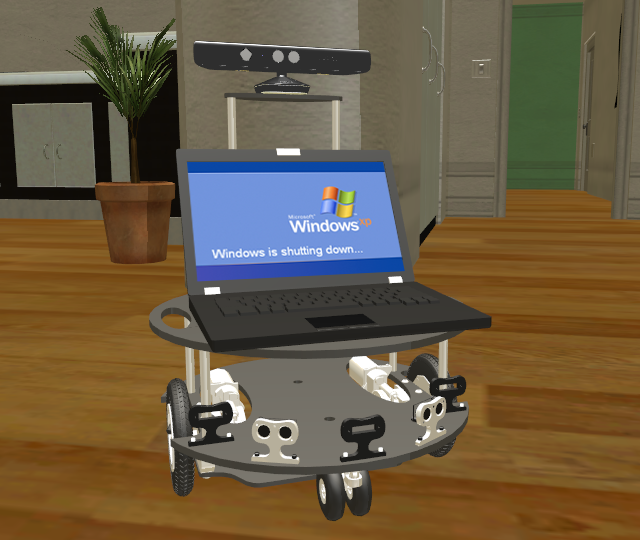 That year, the group showed off some demos, including a mobile robotic platform that used a Microsoft Kinect sensor to navigate [pictured above in a simulation]. As Kinect’s popularity exploded among robot makers and researchers, it appears that the robotics group directed more efforts to areas like vision and navigation (just last week, the group organized an autonomous navigation challenge at an IEEE robotics conference in Chicago). But it’s unclear what the group’s latest ambitions were, and what plan it had formulated to fit into Microsoft’s overall business strategy. IEEE Spectruminquired about the group’s activities over the last year and received no response. It appears that, as Microsoft sought to downsize its research activities, its remaining robotics effort seemed a stretch. * Microsoft originally submitted the Bill Gates article to IEEE Spectrum. But after a disagreement over how much editing the manuscript needed (ahem, we thought it needed lots), the company withdrew it, later running inScientific American. I still fume every time someone mentions that article to me. This entry was posted in Robotics and tagged Microsoft, Robotic Development Studio, Shut Down on September 26, 2014 by enddl22.